Uche Ikpeazu has hinted that his return to action is ahead of schedule, after the Hearts striker told fans on social media: “Not long now”. The 23-year-old has been sidelined since early October after suffering a foot injury in a 1-0 win away to Motherwell in September. He featured against Rangers in a 3-1 loss at Ibrox on October 7 before the full extent of his injury was revealed. 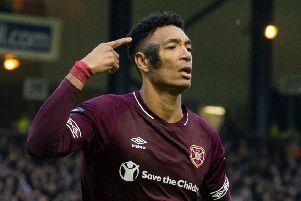 Ikpeazu hit four goals in ten games for Hearts following his arrival from Cambridge United in the summer, but was one of several players struck down by lengthy injury set-backs along with club captain Christophe Berra, influential forward Steven Naismith and defender John Souttar. He was initially ruled out until February, but his social media posts suggests he may be set for a return to action ahead of schedule. Souttar, ruled out for five months with a hip injury around the same time as Ikpeazu’s lay-off was confirmed, is also close to a comeback, with Hearts boss Craig Levein revealing that the Scotland international wasn’t “a million miles away” from being fit for this weekend’s Scottish Cup fourth-round clash with Livingston at Tynecastle.